A Chemical Reaction is screening across the country, and will be in Los Angeles this Sunday afternoon. I'm going to try to make it. A documentary movie that tells the story of one of the most powerful and effective community initiatives in the history of North America. It started with one lone voice in 1984. Dr. June Irwin, a dermatologist, noticed a connection between her patients’ health conditions and their exposure to chemical pesticides and herbicides. With relentless persistence she brought her concerns to town meetings to warn her fellow citizens that the chemicals they were putting on their lawns posed severe health risks and had unknown side effects on the environment. TICKETS: By donation only ($10 suggested). Last night I went to the grand opening party for Dry Bar - an almost green blow dry salon in Brentwood. I say "almost green" because it has some eco aspects, but that's not really the mission. However, the party was co-hosted by my eco buddy Tracy Hepler of Your Daily Thread, so I had to go to support her. Ran into my friends Siel (Green LA Girl) and Erin (Chill Out LA), and made a new friend named Stacey (owner of Green Line Beauty). Natural beauty Josie Maran was there too. I was also happy to see Large Marge Sustainables - love her food! 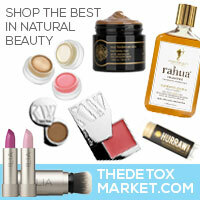 So what is eco about Dry Bar? I'll see if I can find out any more details about how they're eco-friendly. It seems like a cool place - I may try it out since I have a free coupon. It is very trendy and "Brentwood" - lots of fashionable, beautiful women. I liked the space a lot, it's in a good part of town (near Coral Tree Cafe), but I hesitate to go back since their products don't seem to be vegan. Tonight I had the exciting opportunity to attend the NRDC fundraiser featuring James Cameron and his movie Avatar. 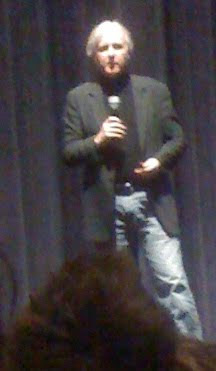 Although I knew that there were environmental messages in the movie, they didn't really sink in until I heard him speak. He showed 40 minutes of clips from Avatar at Fox Studios (in 3D!) and I had an entirely different emotional reaction then when I saw it in the theater. (It certainly helped that Cameron was sitting just a few rows in front of me!) The first time I saw the movie I was focused on the incredible special effects and the story, and was very impressed by them. This time, after hearing Cameron give a summary of the environmental message prior to the clips, it all became clear and I got chills. In fact, some scenes were very uncomfortable to watch the second time around (spoiler alert: when the magnificent tree falls down). Last night my friends and I stopped by Green Drinks at Shades Natural Color in Beverly Hills. I was excited to go there because I've been meaning to check out the eco-vegan salon for a long time. It's a really neat place and I look forward to going in and trying out their services at some point. "I'm Dreaming of a Green Christmas"
While it is a little late in the game, there is still time to green your holidays. 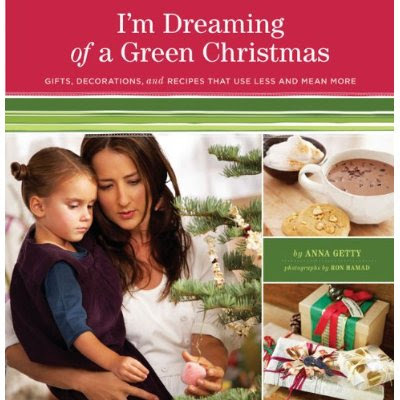 If you're looking for some inspiration and advice, check out "I'm Dreaming of a Green Christmas" by Anna Getty. The book shows you how to make "gifts, decorations, and recipes that use less and mean more", and it is a joy to read. It has beautiful pictures and illustrations that remind you why the holidays are so special. It's a very well laid out book: each recipe and set of instructions are easy to follow, and I love that it has flaps on the cover to allow you to bookmark your place. Simple tips, green facts, and notes from Anna are mixed in throughout the book, giving readers more insight into why it's important to make eco-friendly choices. "I'm Dreaming of a Green Christmas" is mainly composed of instructions for how to make your own decorations and gifts. Some of my favorites are: the newspaper stocking, decorated matchboxes, recycled t-shirt pot holders, and silver leaf wire window ornaments. There are some fantastic tips covering topics like green gift wrapping, shipping, entertaining, and energy efficiency. 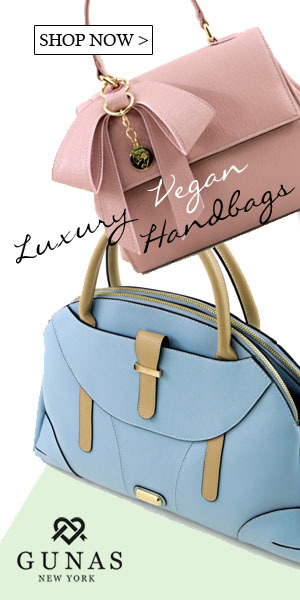 The book also includes several vegetarian recipes, such as delicious looking soups and salads, and most of them can be modified to be vegan. "I'm Dreaming of a Green Christmas" has a beautiful message to share with the world and it will bring the joy of green to many families for years to come! Zem Joaquin said it best in the forward: "Amid a sea of consumption, we need Anna's thoughtful perspective on celebrating a green Christmas". Rent a Live Christmas Tree! Here's my short video with Scotty from last year. A few weeks ago I went to an event by Girls in Tech, called "Impact of Tech on Green & Good". It featured my friends Siel and Tracy Hepler, and I fellow green girls Sarah Townsend (of Social Vibe) and Sandra Sanchez. I passed a neat looking store in West Hollywood called Earth Class Mail. Since it had the word earth in it, I wondered if it was eco-friendly. It is. Check out Mambo Sprouts for info on healthy and green products, and they even have a coupon section!